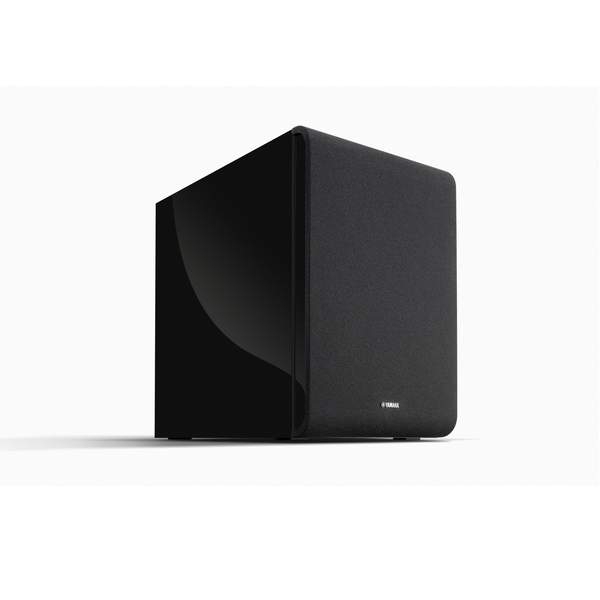 In today’s market, the call is for subwoofers in much smaller form factors but without any sacrifice in performance. Part of Paradigm’s success in this area is our proprietary design, our commitment to high-quality materials and a process known as Finite Element Analysis (FEA). FEA allows us to analyze the movement of the cone, monitor magnetic flux, evaluate heat dissipation and perform stress analyses on both component parts and the enclosure. We can enact “what if” scenarios, making virtual material substitutions or design changes and observing their effects on the magnet/motor structure before we even start building a sub. This ability to experiment is what has allowed us to achieve such incredible performance from a form factor as small as that of the tiny Monitor SUB 8. Ultra-Class-D™ Power Amplifier with Unique Switching Power Supply. BIG Power from a Compact Package: The low-noise high-power compact transformer (0.29 lb/0.13 kg) boasts an ETD core purpose-designed for smaller applications that must have high power. Noise suppression networks and top quality MOSFETs help to achieve high current but with quiet operation. Unlike conventional Class-D amplifier designs, our design inherently rejects variations in the power supply. Full-Bridge Output Stage: Operates from split power suppy rails ensuring exceptionally low distortion. Not only does the design increase the speed of switching it also dramatically increases switching efficiency. Precision Driver Components and Military-Spec (FR-4-Rated) Glass-Epoxy Circuit Board: Reference-quality component parts and a circuit board painstakingly designed by hand guarantee an enviable degree of performance and long-term reliability even under extreme conditions. Unique Temperature Sensors: Maintain a safe operating temperature even when the Monitor subwoofers are operating under maximum output conditions. 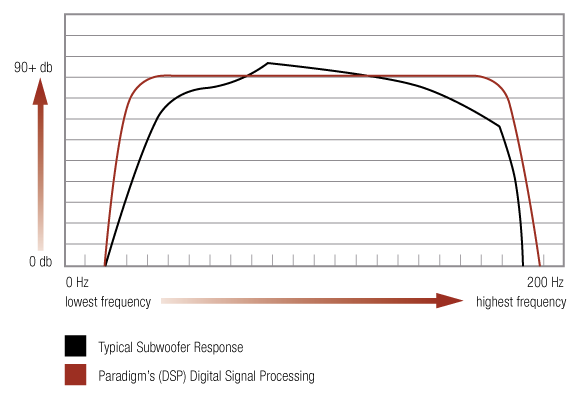 Superior Short Circuit Protection: Should current through the MOSFETs exceed our internally preset limit, the Digital Signal Processing (see below) disables the output stage. Reaction time is typically within 10 μs. Digital Signal Processing: Monitors the line current and voltage so that long-term average output power remains continuous. Sophisticated mathematical algorithms shape frequency response (see graph) ensuring accurate, consistent and musical bass without distortion even when the subs are pounding out bass at the highest levels. 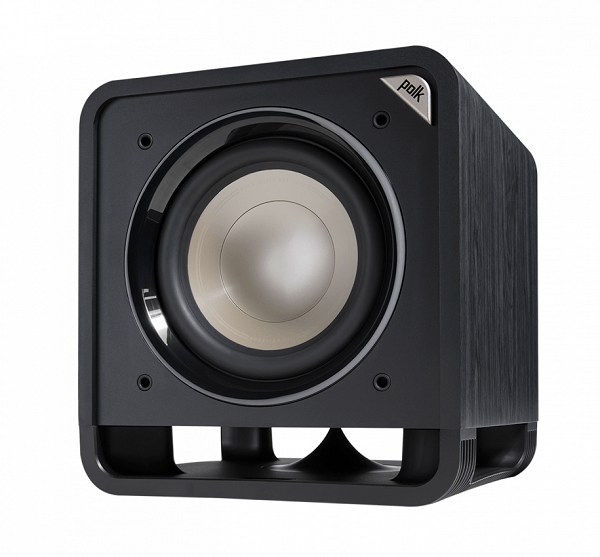 A high stiffness-to-mass ratio is an important aspect in a woofer’s ability to deliver that loud, deep, clean and articulate bass we all desire. In this case, in-house injection-molding and a 30% carbon content made for a wonderfully stiff cone while the polypropylene, an inherently well-damped material, delivered the necessary lightness, the cone is never weighed down in its movement. 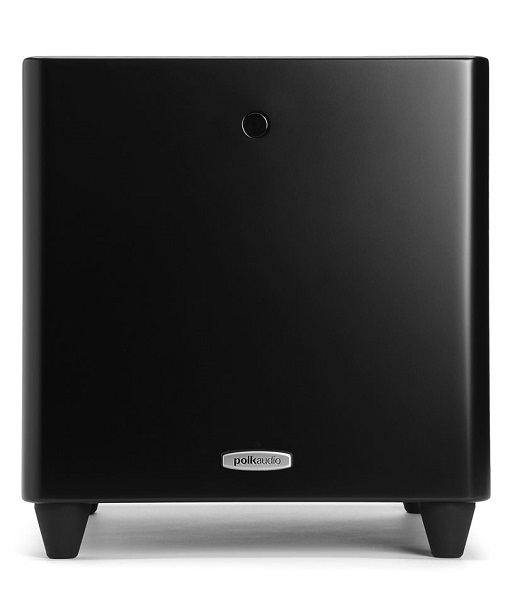 An extreme low-density thermoplastic elastomer, Santoprene possesses the flexibility and durability of rubber but with longer life expectancy and improved tolerance for operating extremes — exactly what we want in a woofer. Building on our success with this design in our high-end Signature series, Paradigm engineers created a new 3D model for the more compact Monitor subs. We applied FEA to conquer areas of concentrated stress, verify and perfect symmetry of motion and push the limits of excursion. The corrugations were also optimized — height, width and quantity — to assist in achieving the unbelievable one and a half inches of excursion on SUB 12 and only slightly less in its smaller siblings. Dimpling and cone wrinkling? Non existent even at full-on output. We then molded the surround over the cone edges to ensure a superior long lasting bond.